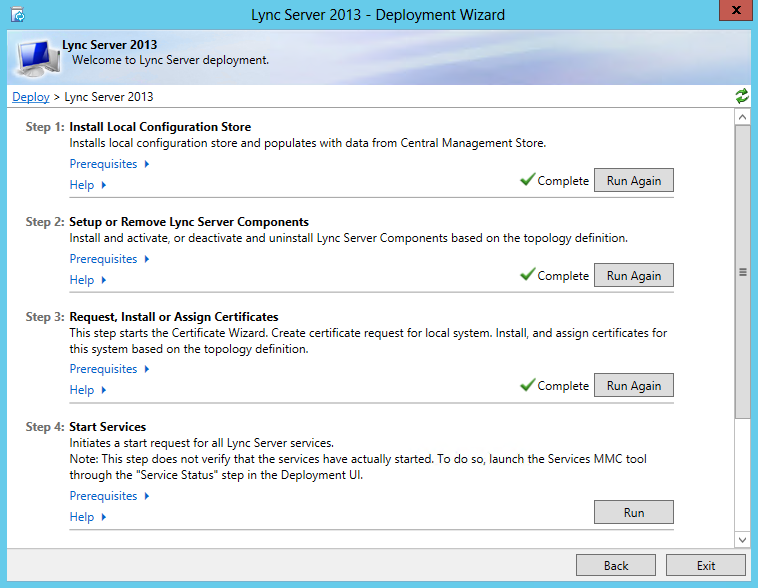 Whenever you make a change to your Lync topology via Topology Builder, you need to publish that topology. 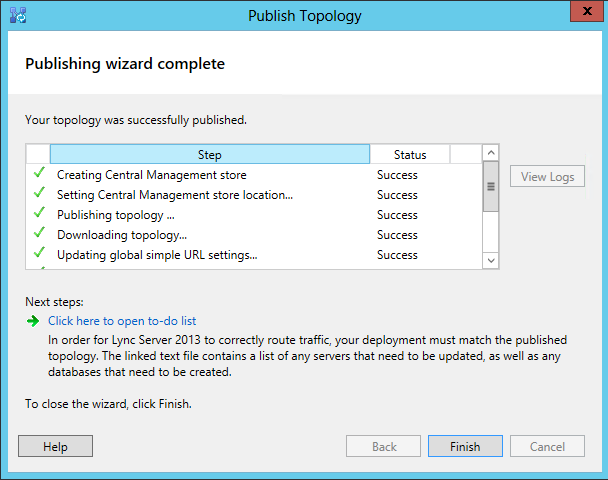 Publishing writes the new topology information into the Central Management Store database, and then Lync servers in your deployment read the information to determine their new configuration. 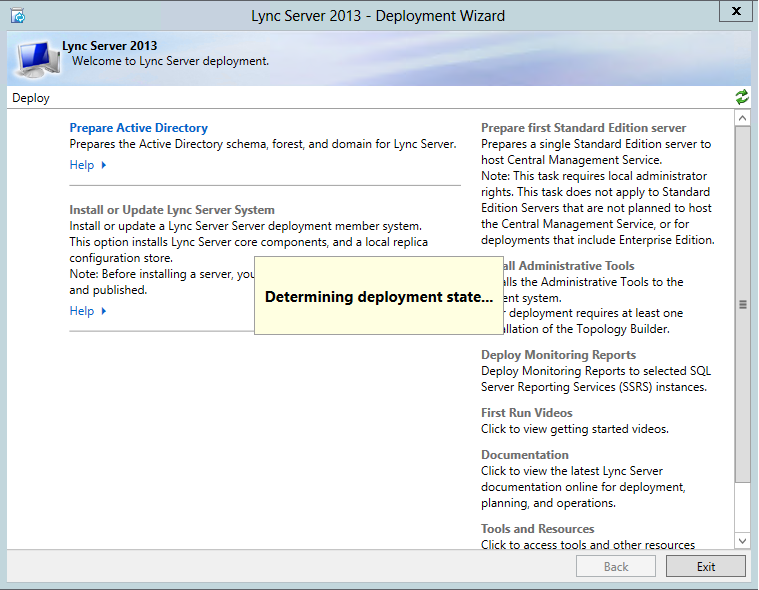 Depending on the changes you’ve made, Lync may present some Next steps for you to take to complete the deployment. (Oops! Did you click Finish before you opened the file? Not a problem – you can find it in %temp%/TopologyBuilder/. Look for the folder with the date and time you’re interested in, and then open NextSteps.txt. If the file is empty, there are no next steps for you to take). We can see that the instructions are to run something called “local Setup” on each of the four servers listed. After a quick spin through your start menu, program files, and a futile search effort, you’ll come to the conclusion that isn’t anything called “local setup” to run. Running the Deployment Wizard lands us at a welcome page, and the wizard does some research on what’s been done thus far, and shows you that it’s “Determining Deployment State”. Go ahead and click Run Again for Step 2, and then click Next to kick off the wizard. It’ll dig through the topology changes and install or uninstall components to reflect the changes you made to the topology. When it’s complete, you can view the log, or click finish. I’ve got four servers mentioned in this example. If you’re in a similar situation, you now have the joy of click…wait…click…wait…click…wait on each server. If this doesn’t at all sound like a good time to you, it turns out there’s a better way to get this done. Running bootstrapper.exe does the exact same steps as the Deployment Wizard, and it does so without the delays of determining deployment steps. You could pop a shortcut onto your desktop and run it from there, but remember to check the logs in c:\%username%\AppData\Temp. My preference is to first open a command prompt and run the exe from there, so that I can quickly scroll up to check the output for errors, rather than having to root around for logs to review.